I have been named as a LinkedIn Power profile. That means I am officially in the top ten most viewed profiles of all the people in technology in 2015. LinkedIn now has 20million users so to be in the top ten is amazing. 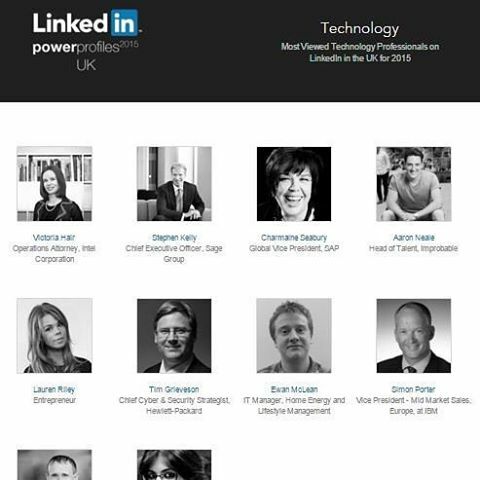 I share the list with some key influencers in the technology sector and it is a proud achievement for me. Not least because I only founded The Link App a little over 18 months ago. My journey from lawyer to business woman is progressing. In typical start-up business owner style, I was actually too busy working to attend the ceremony! Anyone who has ever started their own company will sympathise with this. Weddings, time off, holidays, awards ceremonies, time with loved ones; all of these things are sacrificed in the pursuit of a successful business. But recognition like this makes it all the sweeter. Why I really wanted to send this post out was to say THANK YOU! If it wasn’t for the support of you guys and those that follow me on social media my journey really would not be the same. So I am sharing this one with you, thanks a lot for all the likes, follows, comments, retweets etc. I do personally view all of them and I appreciate every one! People have asked me to share my tips for success. There really wasn’t too much thought went into it if I am honest. I just shared my journey, I keep my posts professional and about my business, I share key updates only. Sometime I add in somethings I think will be motivating along the way or about my passions. I talk about my business but never make sales approaches. The fact that I have been recognised in this way at a relatively junior stage I feel proves the nation is willing start-up entrepreneurs to succeed, that they are interested in the individual blossoming and following that journey. Whatever your goals are for 2016 I wish you ever success with them and am looking forward to sharing even more of my journey with you soon! This entry was posted in BLOG, Business and tagged apps, award, business lessons, Lauren Riley, legal communication, legal tech, linkedin, powerprofile, social media, startup, technology, the link app. Bookmark the permalink.